Whether you plan to pile it atop a freshly baked tortilla chip or drizzle it on a mouth-watering burrito, nothing spices up your food quite like Dei Fratelli's medium salsa. This salsa, made from succulent vine-ripened tomatoes, adds the perfect fresh taste to any dish. A medley of only the best peppers, onions, and garlic intermingle to create the perfect balance of zest. This delicious blend is completed with a selection of premium quality jalapeno peppers, giving an added spicy kick for your customers' taste buds. Dei Fratelli works to provide you with the highest quality produce to prepare your salsa to ensure that every batch is equally delicious. This assortment of thickly diced tomatoes and flavorful peppers transforms everyday salsa to perfection - you could almost swear that it's homemade! Dei Fratelli's original medium salsa recipe is sure to keep even the most selective customers coming back for more. WEBstaurtant carries two salsas, and this one is the more expensive. I thought the difference was in the packaging, with Del Sol coming in a #10 can. I figured the jug would be the way to go, but to reconfigure my fridge to hold this tall jug was impractical, so when i reordered, I bought Del Sol. The biggest difference is not in the packaging, but in the salsa. The Del Fratelli has tons of flavor from tomatoes and/or tamatillas, but the Del Sol is all heat, no flavor. It's like difference between flavorful Siracha and hot sauce. If you serve only alcohol, no food, the Del Sol will probably encourage the consumption of fluids, but the Del Fratelli will leave the customer with functional taste buds, ready to rave to his friends, neighbors, and co-workers. I've noticed, of recent, that Mexican restaurants with high price points and lots of volum4e, tend to have salsa similar to Del Fratelli, while the places that have cheap beer specials tend to have salsa similar to Del Sol. A very good price for salsa. We try to have a cheaper chips and salsa option at our apple orchard and this sweet and salty salsa is a hit. Delicious bulk salsa with a great texture and flavor. Perfect for our deli and great for chips our wraps. Great price and great, quality ingredients. This salsa was used as a basic red salsa on a taco bar with several other "more interesting" choices. It worked great for this. On it's own, it's not particularly memorable, but certainly a strong choice for a basic red salsa. Fresh tasting. I would call it mild, not medium. We used this salsa at our wedding (we had a taco bar for the main course). We hardly had any left at the end of the night! It definitely compares to the store brands! The price was also a huge plus!! This salsa came safely and well packed. It has great flavor with just the right amount of heat. It is kinda chunky and thick so it’s great for chips or to use in food. In love with the Dei Fratelli medium salsa. The gallon jug is great for bulk serving and has a really nice freshly made flavor and texture. 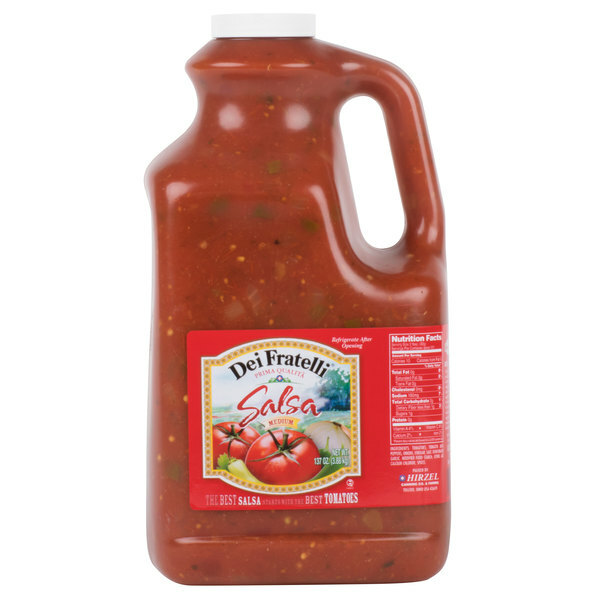 The Dei Fratelli medium salsa is a wonderful quality and pours easily out of the jug. A nice quality salsa at a great price. A great way to have a quick and easy Mexican snack. 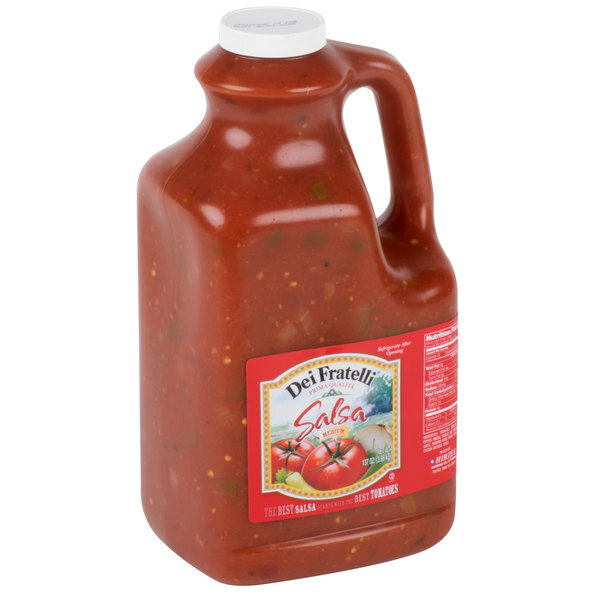 This one gallon jug of Dei Fratelli Medium Salsa is a crowd pleaser for sure. I have completely eliminated all other brands from our restaurant and have never been questioned by any customer. The shelf life is perfect for our regular use and just try beating this great combination of spices. Will order again for sure. A great salsa bursting with a fresh and wonderful quality flavor. It is perfect for serving with chips and quesadillas The salsa is so tasty and I love the consistency. A nice quality jug. A great authentic salsa full of flavor. You can taste the fresh onions and tomatoes and the flavors combine so well. A great buy and easy to pour jug. We love the medium hot salsa. We serve it along side our house made beer cheese queso, or sometimes just by itself. Our customers love it too. I love salsa! And not just with chips but on eggs too! I love salsa that is thicker in texture but authentic Cantina style. A great deal for the amount that you get! This Dei Fratelli Prima quality salsa is Very good salsa, I add fresh cilantro to this for more of a salsa flavor! Not to hot in medium, 121 servings for this 137 ounce container! This Dei Fratelli Medium Salsa is a great deal as it comes in a Gallon jug and is tasty and good for chips or tacos or recipes. It does need to be refrigerated after opening if you do not use it all up in at once and the screw top lid does a fantastic job of keeping in the freshness. I absolutely love this product! This medium salsa 1 gallon jug tastes amazing! These came in a case of four. The salsa is chunky and has a small amount of spice to it. Great medium spicy salsa full of flavor of fresh tomatoes. It is also really thick so I also enjoy a texture. Price is perfect! Just great product! This salsa is good for the price. It's nothing fancy, but it is a perfectly serviceable basic salsa for an ingredient or as a dip. This is a delicious medium salsa. It's not too thin and the amount of spiciness is perfect. It's a great quality salsa and we highly recommend it. We needed salsa for a catering event, our current distributor did not carry a food service size. Low and behold WebR (thats what I call them). Nice price, and I got so many compliments from our client. Wow! We have been using this salsa and we have found that the customers really enjoy it. It stays on the shelf for a while without going bad and it's much easier to pour with this bottle rather than the metal cans. We tried this medium salsa by the gallon jug and the quality was impressive. We decided to order a case of four gallon jugs to increase the value. We will probably order by the case from now on. We use this on one of our custom hot dogs. Great topping consistent productand great tasting. I definately recomend it for use right out of the package. A great tasty salsa that isn't too spicy but still has a nice bite. This makes a great sauce to cook chicken in it gives a great flavor. This salsa is great as it is. When I order the other salsa to be made at work, I actually typically buy one of these to use in my house. It is convenient and doesn't require the 'building' of some of the other base salsas. This Salsa is great, could be used by itself but we dress it up with a few other ingredients, makes a great base or by itself and has a good shelf life. 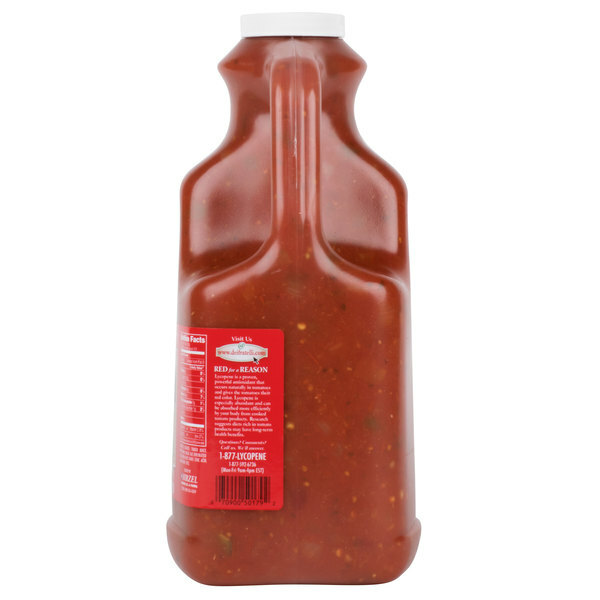 1-gallon of medium salsa is really great to have around for the dips because it is very popular. The medium salsa is spicier than the mild salsa, but not as spicy as hot salsa.